The prose author discusses his comic book sequel to Anno Dracula, his own comics reading history and much more. Kim Newman is a beloved and acclaimed cult writer. Comics fans may only know him for his 2015 miniseries Witchfinder: The Mysteries of Unland, but prose fans know him for his dozens of books which include Professor Moriarty – The Hound of the D’Urbervilles, The Night Mayor, and the Diogenes Club series. Perhaps his best known works are the series Anno Dracula. The 1992 novel is something of a what if – what if Dracula defeated Van Helsing. The resulting novel – and the sequels – mixed real life figures and literary characters in a way that is much more common today than it was when the novel first came out. 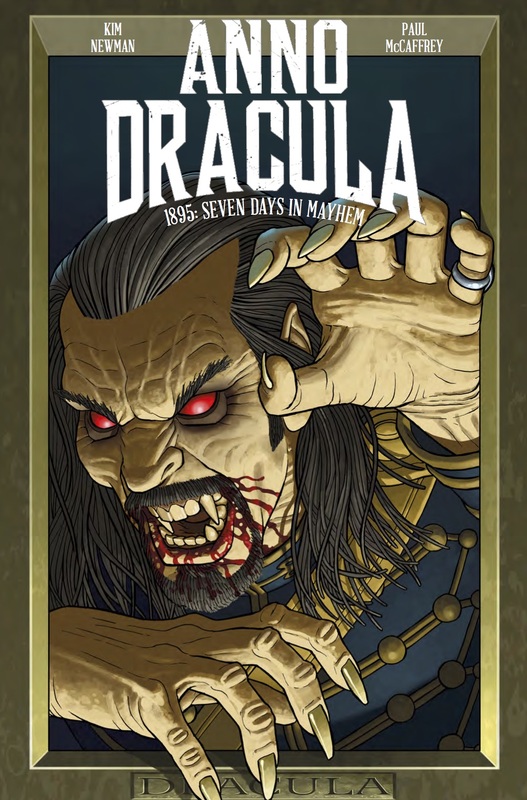 The new miniseries from Titan Comics, Anno Dracula 1895: Seven Days in Mayhem, is written by Newman and illustrated by Paul McCaffrey. The comic, which wraps up this week, is a direct sequel to the novel Anno Dracula – and a prequel to the second book in the series Bloody Red Baron, which takes place in World War I. Like the novels this one mixes real and fictional worlds. Newman was kind enough to talk about the miniseries, his novels, and everything from Philip Jose Farmer to possible comics crossovers he’s eager to write.